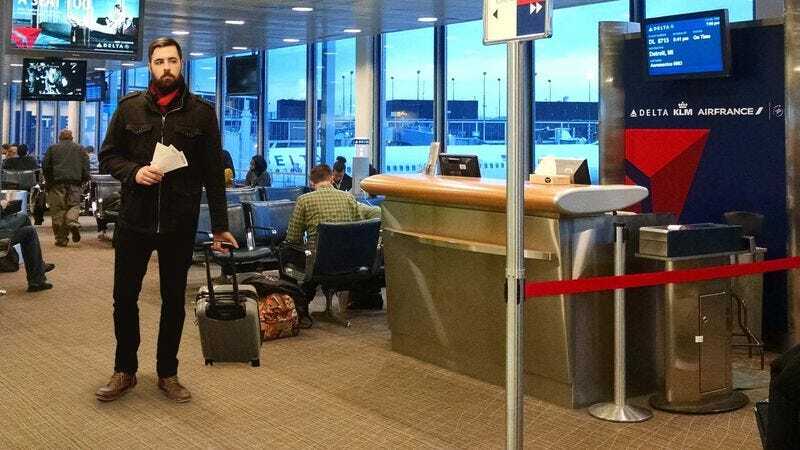 SAN FRANCISCO—Slinking stealthily as he scanned the departure desk for any sudden movement, local man Aaron Smith reportedly prowled San Francisco International Airport’s gate 33 Friday like a jungle cat ready to pounce at the first sign of a boarding announcement. Smith, whose pupils had fully dilated after witnessing the gate agent lean in toward her microphone, is said to have frozen in place, tightening the grip on his carry-on bag and tensing his entire body as if he were a jaguar ready to lunge at a marsh deer drinking from an Amazonian water hole. According to onlookers, Smith tracked the elderly travelers and passengers with disabilities during the pre-boarding process like an apex feline predator eyeing the weakest member of a herd to isolate and ambush, his gaze fixed and intense as attendants guided the group’s wheelchairs down the jet bridge. At press time, after the gate agent announced that passengers in the first zone could begin to board, Smith reportedly pulled his ticket from his pocket with lightning-quick reflexes and charged forward to the front of the queue in a manner identical to that of a leopard bounding after a spooked warthog.